Quiapen was a powerful Niantic female sachem through birth and marriage and was the last Narragansett-Niantic leader to be captured or killed in King Philip's War (1675-1676). During the summer of 1676, Quaiapen and her followers, mainly women and children, sought refuge from the hostilities of King Philip's War in Nipsachuck Swamp, just east of this pin's location. On July 2nd, they were attacked by Major John Talcott. Among the dead were Quaiapen, one of her chief counselors, Potuck, as well as roughly one hundred of her followers. Dozens more were captured and likely sold into slavery. With Quaiapen's death, Narragansett participation in the war ended, as did any hope for peace negotiations. Prior to her death, Quaiapen had fled north to Nipsachuck Swamp from Queen's Fort (Exeter). Queen's Fort was likely built under the direction of Stonewall John, one of the earliest masons among the Narragansett. At Queen's Fort, Quiapen and her followers had been attacked by Josiah Winslow in December of 1675. During the attack 150 wigwams, called weetoomash by the Narragansett, were burned. Several individuals were killed, and others taken prisoner. Before fleeing north to Nipsachuck from Queen's Fort, it is believed that Quaiapen retreated to the Great Swamp (South Kingstown, RI) for a short time. Though, if she did, she would have escaped the massacre that occurred there on December 19th, 1675. Following Quaiapen's death at Nipsachuck Swamp in the summer of 1676, 80 Narragansett men surrendered to Major John Talcott and were killed in what is now called the Warwick massacre. In 2011 and 2012, excavations were conducted at Nipsachuck Swamp through the National Park Service American Battlefield Protection Program. 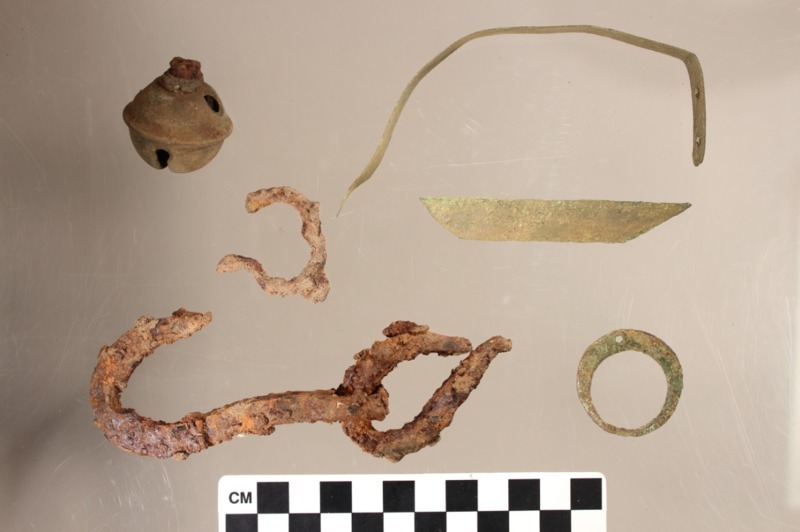 Through this work, 150 battle-related and domestic objects were uncovered in a 67-acre parcel deemed to be the battlefield. Likely battle-related objects included musket balls, brass arrow points, gunflints, horseshoes, shoeing nails, a bridle rosette, firearms, and firearm parts. Other artifacts included a bell, a brass pendant, a carved quahog fragment, pewter buttons, and a piece of a jaw harp. Items Retrieved from Nipsachuck Battlefield Excavation : Here are some of the items uncovered at Nipsachuck Swamp. They include a copper bell, some cut brass, part of a jaw harp, an iron hook, and a copper pendant. ~ Source: National Park Service's American Battlefield Protection Program. Technical Report “The 1676 Battle of Nipsachuck: Identification and Evaluation." 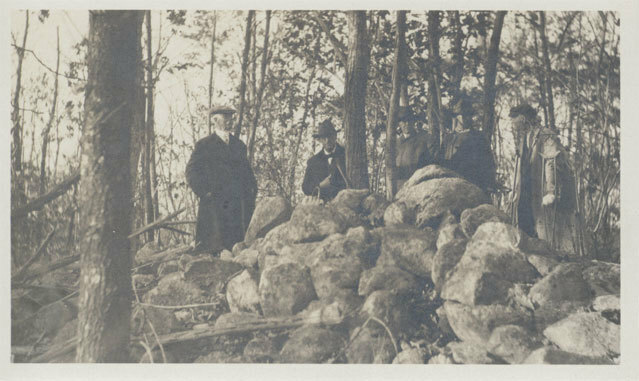 Photo at Queen's Fort in North Kingstown, 1921.: Here is a photo of Howard W. Preston (middle), James N. Arnold (crutches) et al., atop Queen's Fort. 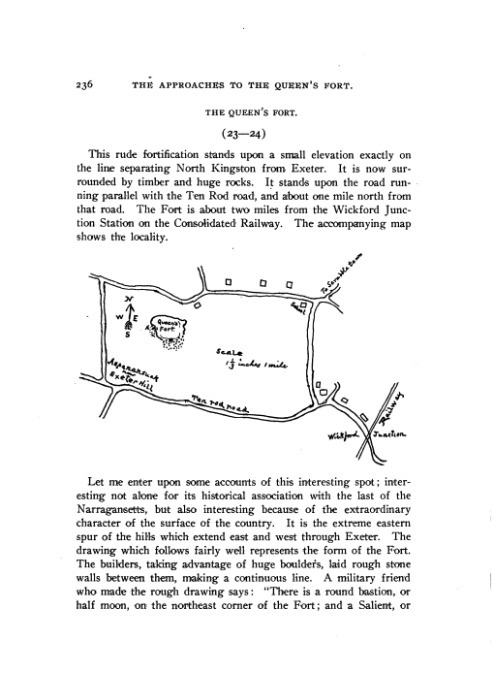 Map of Queen’s Fort #1: This image, and the next, are maps of Queen’s Fort in North Kingstown. They were first published on pages 236 and 237 in Sydney Smith Ryder’s 1904 book, The Lands of Rhode Island: As They Were Known to Caunounicus and Miantunnomu when Roger Williams Came in 1636: an Indian Map of the Principal Locations Known to the Nahigansets, and Elaborate Historical Notes. 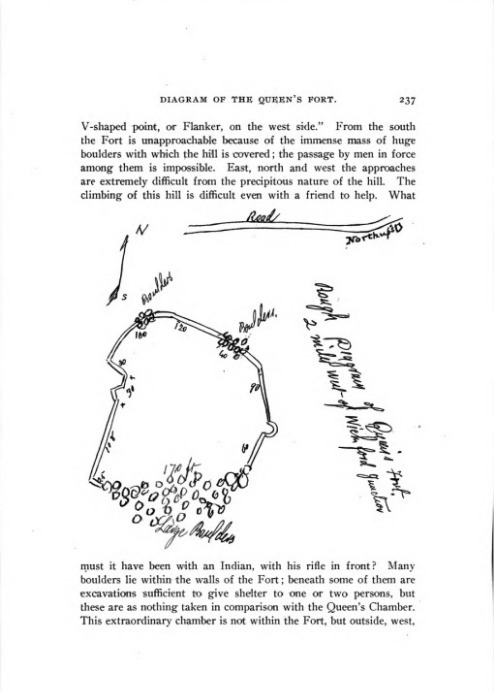 Map of Queen’s Fort #2: This image is the second drawing of Queen’s Fort in North Kingstown. This image, and the previous, were first published on pages 236 and 237 in Sydney Smith Ryder’s 1904 book, The Lands of Rhode Island: As They Were Known to Caunounicus and Miantunnomu when Roger Williams Came in 1636: an Indian Map of the Principal Locations Known to the Nahigansets, and Elaborate Historical Notes. 276 Douglas Pike, North Smithfield, RI 02896 ~ Location is approximate. Please note that much of the land east of the intersection of Douglas Pike and Mattity Road, toward Mattity Swamp, is private. Do not disturb residences or trespass on private property. Many Native societies in southern New England were matriarchal--a fact that often shocked the English and other Europeans. Wawaloam, one of Miantonomi's wives, was a female Sachem among the Narragansett and is the namesake of Wawaloam Elementary School in Exeter. A large boulder on school grounds is reported to be the site of her burial. Quaiapen was a sister of Ninigret and married Canonicus' eldest son, Mixan (or Mexanno) in 1630. When Mixan died in 1657, she took control of his lands around Cocumscussoc. Learn more about Narragansett stone masons through a preview of the film Stories in Stone. 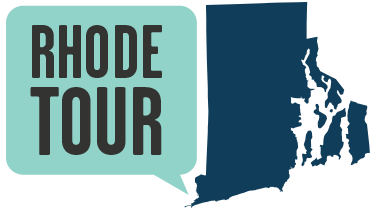 Katharine Kirakosian and Tomaquag Museum, “Quaiapen,” Rhode Tour, accessed April 21, 2019, http://rhodetour.org/items/show/296. Bataille, Gretchen M. and Laurie Lisa (editors) 2003. Native American Women: A Biographical Dictionary. Routledge.